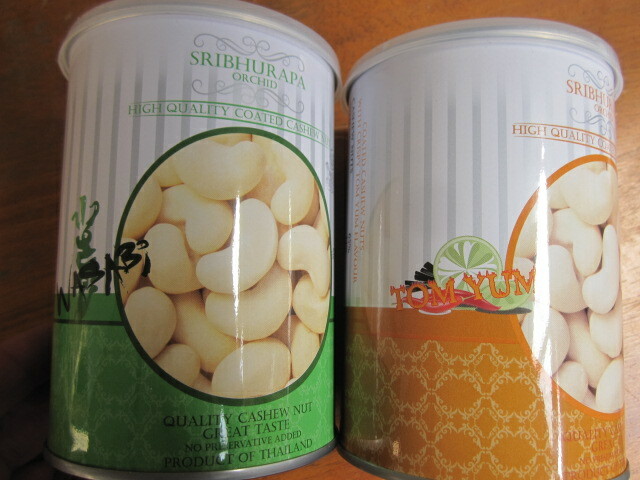 One of the places we visited was the Sri Bhurapa Orchid Cashew Factory. I had never even thought about how cashews grew, and we were very surprised to learn that the cashew nut itself grows on the end of a fruit, rather pear-shaped, but red and yellow. 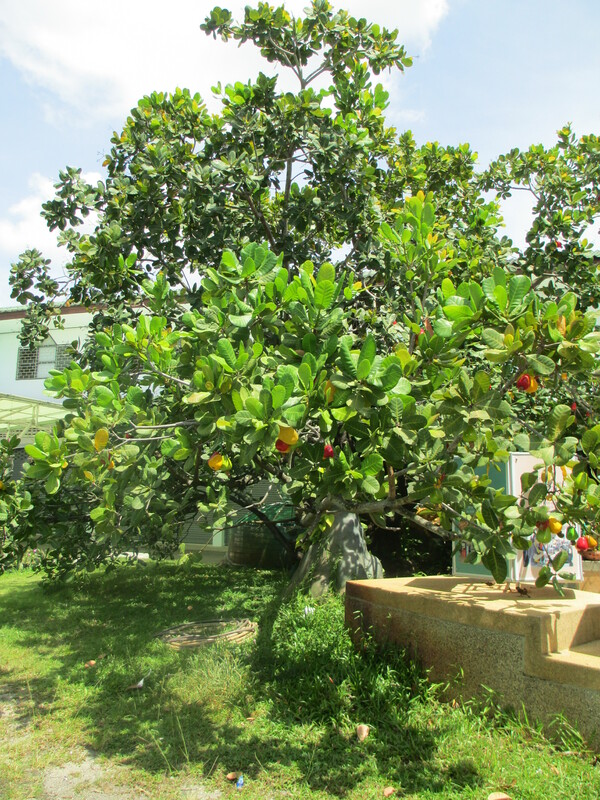 The cashew tree outside the factory is decorated with imitation fruit to indicate its colour and size. 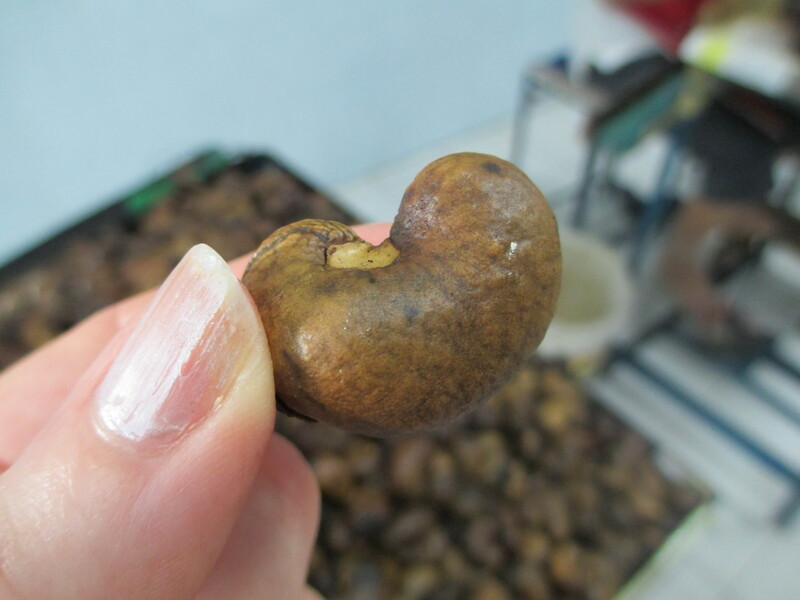 Each of these larger fruits only produces ONE cashew nut. The tree only fruits once a year. I for one am never going to complain again about the price of cashews. A worker demonstrated the removal process. I couldn’t believe the size of some of the nuts. There are so many other lines I could add to this, but won’t. 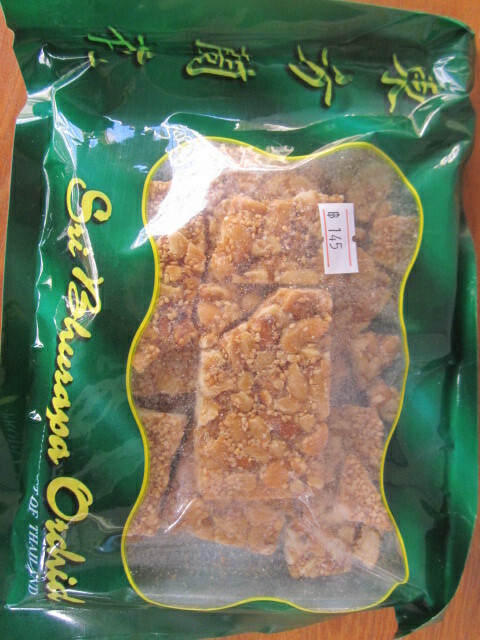 We bought a pack of cashew nut slice, coated with sesame seeds, similar to nut bars that you buy in Australia. At the factory we were able to sample various flavoured cashews. I love cashews raw, roasted, salted, even unsalted, so I didn’t think the flavour needed tampering with. However, some of the varieties were delicious. Deciding one can each would be sufficient, (just in case our luggage weighed too much), I chose the Tom Yum flavour – we were in Thailand after all, and my husband opted for the spicier Wasabi variety. Now that I have looked more closely at the ingredients of my tin, it appears that the tin contains only 65% cashews, 14% wheat, 11% corn flour, 8% sugar, 1.5% palm oil and 0.5% Tom Yum Powder. Oh well, I guess that’s usually the case when you buy flavoured items. It takes away from the naturalness of the actual nut. The 215 gram tin cost 195 THB, about AUD $6.50. I just realised you could have nearly a whole dinner in Patong for that price! 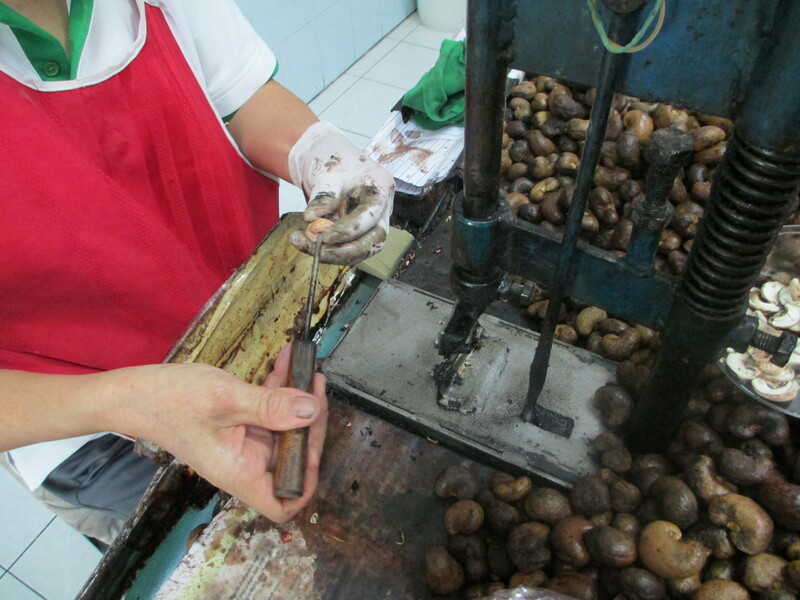 Obviously this cashew factory is aimed very much at the tourist market, but it was a good experience. 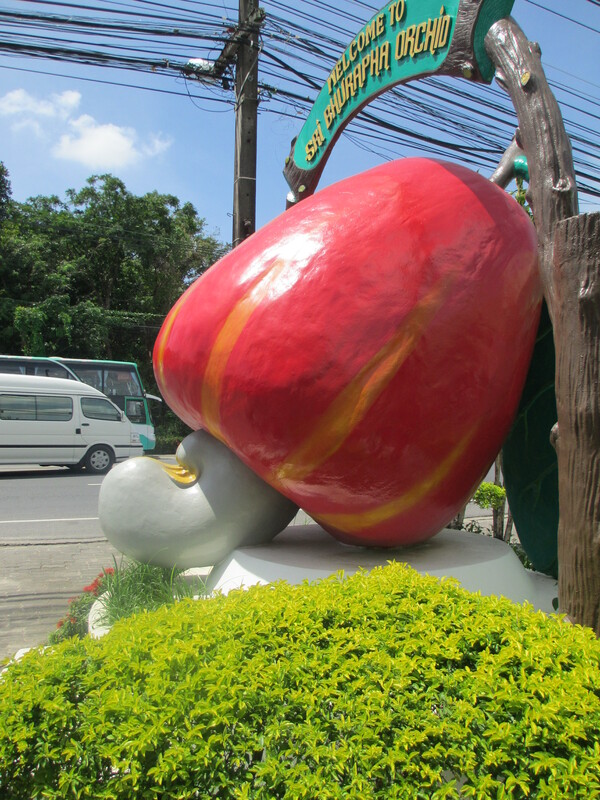 This entry was posted in Activities, Food, Thailand and tagged cashew factory, cashew tree, cashews, flavoured cashews, Phuket, Thailand. Bookmark the permalink. Very interesting, and also makes me think about why the costs of certain things are the way they are…eg. Our Ice Wine. The best things in life are costly. What about the saying “the best things in life are free”? However, I know what you mean about labour-intensive items being expensive, and rightly so. You probably have to go to Thailand.